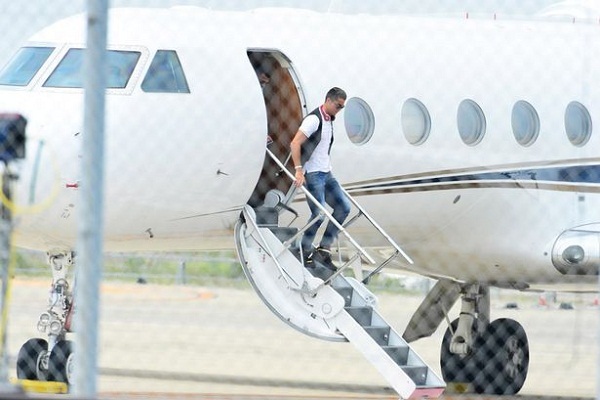 Cristiano Ronaldo will be grounded for the foreseeable future after the superstar's private jet crashed on landing at Barcelona's El Prat airport. Eyewitnesses report that the plane's landing gear broke on impact with the runway, forcing emergency services into action. Sources close to the Ballon d'Or favourite told MirrorFootball: "The plane is normally rented by companies and it was in use by one of them. "Cristiano Ronaldo, his family or friends were not on the plane. The incident had no major consequences." Indeed, the former Man United man would finish a brilliant move to open the scoring for the defending champions but Dortmund equalised through Pierre-Emerick Aubameyang to ensure both sides took a point from a topsy-turvy game at Signal Iduna Park. Aubameyang swapped shirts with Ronaldo, before reaching out to the Madrid star on Instagram with a picture of his son gleaming from ear to ear and holding the grass-stained No.7 shirt. The 27-year-old wrote in the caption: "Cristiano, you've made my son happy." The return fixture at the Santiago Bernabeu on December 7 promises to be one of the most explosive contests of the group stage. The European giants now sit joint-top Group F on four points with Sporting Lisbon, the only threat to a predictable one-two finish, tucked in one point back on three points. Zinedine Zidane will turn his attention back to La Liga with a tame fixture against Eibar this weekend, while Thomas Tuchel's side will be pushed to raise it once again away to Bayer Leverkusen.